It’s time to swing into everything we created this week! Obviously, Thursday’s are dedicated to Mic Check releases each week, but we can also tease that which occurred during Tuesday’s episode taping, like how we had Molly Kamph and Caity Shea Robertson on this week (Yes, we had posted a picture on our Twitter feed that we’d have Nick Johnson on this week, but he was called away at the last minute for work, and Caity was kind enough to sit in). So Adam and I had a great time with Molly and Caity, and everything got nice and abstract to get us from news story to news story before we got to Movie Bluff. Make sure to listen all the way through this week’s episode, as we have our first ever “Buffering …” Celebrity News segment after the end theme. Right. Enough stalling. It’s time to get you some Mic Checks. During this week’s Mic Check, we wandered all over the spectrum of abstract conversation, hitting upon dictators, Caity’s monkey daycare, and marsupials (as well as some of our dream marsupial hybrids). You can find it on this week’s EPISODE PAGE. Or by clicking HERE. Or HERE. 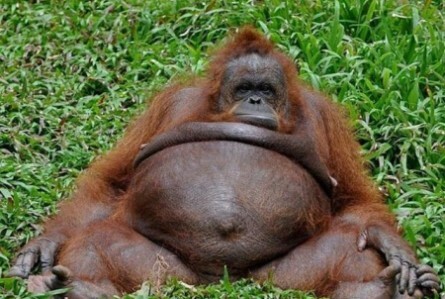 So now I guess that answers why the fat orangutan has been watching you the entire time you’ve been reading. Enjoy!